Mill Spring, N.C. – US Equestrian announced this morning that Will Coleman (Charlottesville, Va.) and Tight Lines, The Conair Syndicate’s 11-year-old French Thoroughbred gelding, will step in as a substitute combination for The Land Rover U.S. Eventing Squad at the FEI World Equestrian Games™ (WEG) Tryon 2018. Coleman and Tight Lines were named as a reserve combination when the Land Rover U.S. Eventing Squad was announced in June, and will now serve as substitutes for Marilyn Little (Frederick, Md.) and RF Scandalous, the 13-year-old Oldenburg mare owned by Jacqueline Mars, Michael Manders, and Phoebe Manders. Regrettably, RF Scandalous sustained a minor, lower limb injury during the final training session that will keep her and Little from competing at the WEG. While the prognosis for the mare is very good, under guidance from the U.S. team veterinarian and in the best interest of the horse, Little made the decision to withdraw RF Scandalous and not move forward with competing. 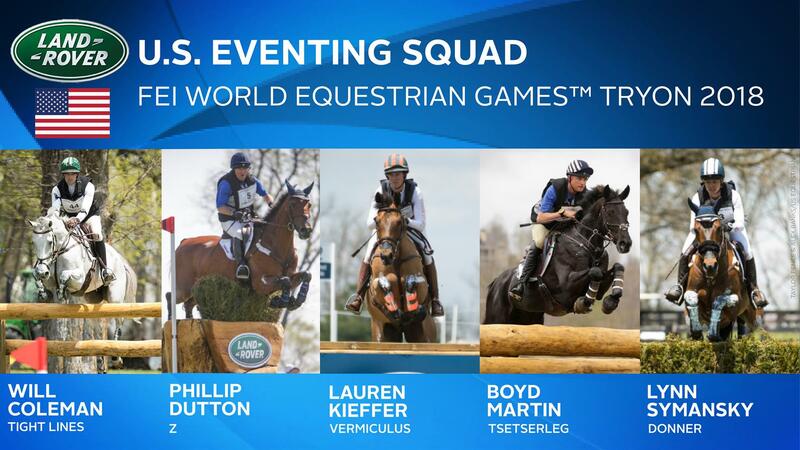 Competition begins for the Land Rover U.S. Eventing Squad on Thursday, September 13. View the full WEG Eventing Schedule here.